MarsHillPicker, wardcleaver, Foghorn Leghorn Fan and 1 other person like this. Many people love the quality of Boker knives, but no one can tell you much about them. 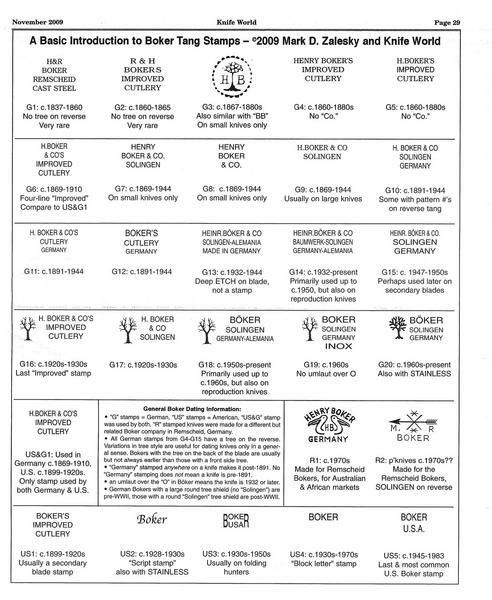 When Mark Zalesky wrote his article containing this tang stamp chart in Nov 2009, he created the number one resource on dating old Boker knives. I keep a copy of this tang stamp, and Mark's original article by my computer for quick reference. Great info for identifying approx age of a Böker knife.